Dr. Chris Nunn has served Montgomery County, providing state-of-the-art dentistry since 1997. He was born in Ft. Worth and raised in Conroe. He graduated from Conroe High School in 1987 and received his bachelor’s degree in Biomedical Science from Texas A&M University in 1993. After graduating from college, Dr. Nunn worked with a cancer research team in The Woodlands, Texas before beginning dental school. In 1997, he earned his DDS degree from The University of Texas Dental School in Houston. 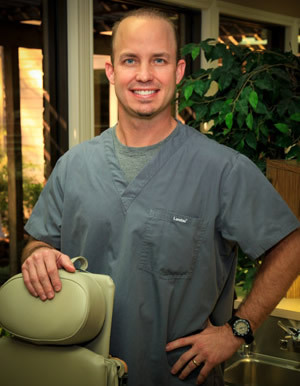 Dr. Chris Nunn has been practicing dentistry in his hometown of Conroe with Dr. Jerry Herrington since 1997. Dr. Nunn is a member of the Texas Dental Association, Brazos Valley Dental Society, and the American Dental Association. He has completed extensive post graduate training in complex restorative and cosmetic procedures through the acclaimed Kois Center in Seattle, WA and the Aesthetic Restorative Continuum at Baylor College of Dentistry in Dallas, Texas with Dr. Steve Cutbirth. Dr. Nunn lives in Montgomery with his wife, Shannon and their two sons, Alex and Garrison. He enjoys spending time with his family and friends, exercising, watching sports, the outdoors, hunting, and fishing.